The characterization of diseases in terms of perturbed gene modules was recently introduced for the analysis of gene expression data. Some approaches were proposed in literature, but most of them are inductive approaches. This means that they try to infer key gene networks directly from data, ignoring the biological information available. 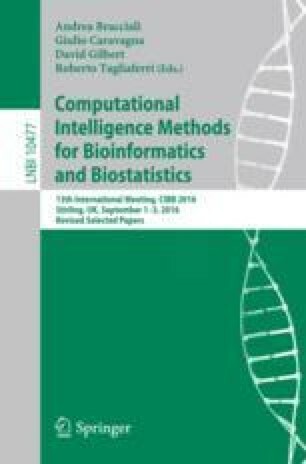 Here a unique method for the detection of perturbed gene modules, based on the combination of data and hypothesis-driven approaches, is described. It relies upon biological metabolic pathways and significant shortest paths evaluated by structural equation modeling (SEM). The procedure was tested on a microarray experiment concerning tuberculosis (TB) disease. The validation of the final disease module was principally done by the Wang similarity semantic index and the Disease Ontology enrichment analysis. Finally, a topological analysis of the module via centrality measures and the identification of the cut vertices allowed to unveil important nodes in the disease module network. The results obtained were promising, as shown by the detection of key genes for the characterization of the studied disease. This research was funded by the MIMOmics grant of the European Union’s Seventh Framework Programme (FP7-Health-F5-2012) under the grant agreement number 305280.